The subject of women’s hair and scalp concerns is an emotive one, but my profession of Trichology is my absolute passion! 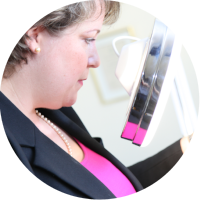 I will discuss in detail various conditions that I diagnose and treat at Sussex Trichology with the aid of my assistant; we successfully treat most hair loss and scalp problems. I find the most upsetting part of losing one’s hair is fear of the unknown and of feeling ‘out of control’ with the changes that can seem to deteriorate overnight. There are many reasons for this age group for women to experience hair loss or a scalp condition, in most cases the age is irrelevant. The following case history details a condition that can affect anyone from the ages of puberty up. 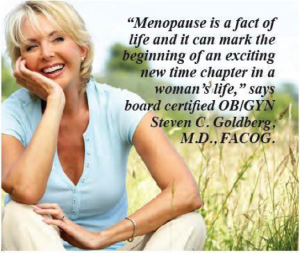 Unfortunately, there are certain, medical practitioners who believe the menopause is the only reason. I may, for example, feel your current HRT should be another (I would request this from your doctor) or that a blood test appears prudent, or simply be able to diagnose your condition and discuss treatment. Hi, I’ve been experiencing hair thinning on and off for the past 12 years, I am 62 and recently the problem has become much worse, therefore I would like to book a consultation appointment. look forward to hearing from you. This is a typical enquiry, it’s a specific thinning condition as the photograph below shows. 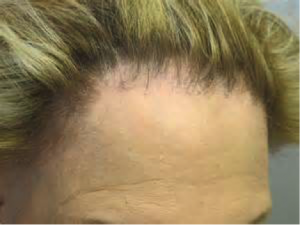 This patient is unlikely to shed hair but notice a gradual reduction in the density of the hair in one area called Androgen Dependant Alopecia (female pattern thinning). In women the hairs are not lost permanently but become finer hairs, therefore, I am able to both arrest this genetically inherited condition and improve density to a cosmetically acceptable level. My honest and holistic approaches are applied to each case, so every individual leaves with a clear understanding of their condition. While the majority of my patients are women who attend (often with a friend for moral support), I see many Mothers and Daughters attending together, in fact my assistant is the daughter of a patient of mine who was so impressed with my plight to “put back into the community” that she applied for the position of Trichotherapist. It is lovely to see families who support each other with conditions which can totally demoralise you and impact massively on the quality of your life and self-esteem! 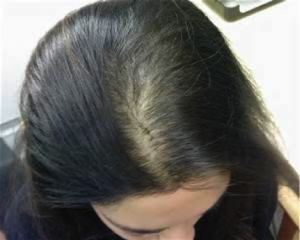 See here for a testimonial from a patient of mine who has this condition, including how it made her feel: Samantha suffered from Hair Thinning & Hair Breakage. Read what she said about us. I regularly see menopausal women with many different conditions: hormonal changes can be a trigger to certain genetically inherited conditions such as Androgen Dependant Alopecia (as pictured above), nutritional deficiencies, medication side effects, stress and anxiety related hair loss, scarring hair loss which can involve the loss of eyebrow hair and all scalp conditions including Dermatitis and Psoriasis.